My wrist might not be broken after all, just badly sprained. Another doctor said the strange bump on my scaphoid bone is probably a natural variation. And after a few days of pain medication and wearing a brace, I’m feeling much better. Hurrah! 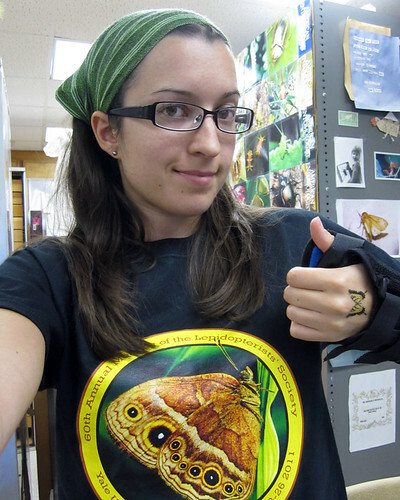 Here I am in my Lep Soc t-shirt, and sporting a temporary tattoo of a tiger swallowtail, one of my favorite butterflies (mostly because they’re fun to chase). Back in the lab tending to my babies (err… caterpillars…), and this evening I’m going collecting on a Lep Soc field trip. Hoping for some more gravid female Acronicta. Posted on June 26, 2011, in Update. Bookmark the permalink. Leave a comment.